NASA’s End State Flow Review (ESFR) has refined preliminary arrangements and schedules for Discovery’s immediate post STS-133 future, as well as where the orbiter’s SRMS (Shuttle Remote Manipulator System) arms and OBSS (Orbiter Boom Sensor System) arms will end up once the Shuttle Program comes to an end next year. This plan, which originally proposed maintaining Discovery in or near flight condition for as long as possible following STS-133, has undergone significant analysis in the months that followed the initial review; as a result of this analysis, SSP (Space Shuttle Program) managers have revised their proposal for Discovery post STS-133. “SSP Management has requested that we plan to release OV-103 to T&R (Transition and Retirement) at wheel-stop,” notes the ESFR – available for download on L2. The immediate release of Discovery from flight service would be followed by the removal of her two OMS pods (Right Pod 03 and Left Pod 01, known as RP03 and LP01) and Forward Reaction Control System pod (FRC3) after her return to OPF-3 (Orbiter Processing Facility bay 3). Once removed and sent to the HMF (Hazardous Materials Facility), the SSP has further requested that the pods be removed from flight status and handed over for T&R processing. “Post STS-133, upon delivery of Pods and FRCS to the HMF, request authorization to release RP03, LP01, and FRC3 from flight status to T&R processing. At that point, OMS Pods and FRCS will no longer be considered flight hardware,” notes the ESFR document. At this time, specific risk analyses for the release of the OMS pods and FRCS pod from flight service have been performed to determine any negative effects on the Space Shuttle Program’s ability to flyout the post STS-133 manifest without these pieces of hardware. No negative affects were identified. Furthermore, the release of further hardware from flight status upon the completion of STS-133 will be performed over the coming month and presented at the Delta ESFR. This meeting is currently planned to occur roughly one month after Discovery’s landing on STS-133 – the time when technicians will complete down-mission processing activities on Discovery. Moreover, alternative to the above mentioned request to remove Discovery from flight service/status at wheel-stop on STS-133, placement of Discovery into T&R could be deferred to the Delta ESFR. Nonetheless, while Discovery herself may be released from flight status upon or one month after the completion of STS-133, the standard post-flight inspections and analyses will be performed to maintain fleet and post STS-133 mission safety. This includes all standard post-flight problems tracking teleconferences and reporting, File IX review for items affecting safety, In Flight Anomaly resolution and closure, MADS data review, Micro-Meteoroid Orbital Debris (MMOD) inspections on her windows, payload bay doors and RCC (Reinforced Carbon-Carbon) panels and nose cap, and all standard TPS (Thermal Protection System) post-flight inspections. Following the completion of down mission processing, technicians will remove from Discovery all the necessary flight hardware that has been identified for preservation through the flyout of the Shuttle manifest, identified for future use or belonging to a payload customer, and identified as necessary for the support of another Program. This will involve the removal of ROEU, ELC keel, DragonEYE, LWAPA, payload bay & umbilical cameras, TSA, winches, PFR, OBSS sensors, and the TCS (Trajectory Control Sensor). Conversely, most payload accommodations and CIH hardware (including wiring and panels), latches, bridges, and GAS beam will be left installed as part of Discovery’s museum display configuration. Likewise, Discovery’s SRMS (Shuttle Remote Manipulator System – robot arm) and OBSS (Obiter Boom Sensor System) will be left installed for her museum display. This full up SRMS/OBSS configuration will also be implemented on Atlantis during her T&R processing. Endeavour (OV-105), however, will return from her last mission without her OBSS, having left it on the ISS (International Space Station) to act as an extension arm for SSRMS (Space Station Remote Manipulator System). Endeavour, upon T&R processing, will also have her SRMS removed and sent back to Canada (the maker of the SRMSs for the Shuttle orbiter fleet) for display in Canada as recognition for their integral role in the Space Shuttle Program. Discovery will also receive a full set of middeck lockers for display configuration. A remaining full set of lockers will be divided between Atlantis and Endeavour. Also in terms of Discovery’s museum display configuration is the type of engines she will sport. As previously reported by NASASpaceflight.com, Discovery and sisters Atlantis and Endeavour will not carry flown SSMEs (Space Shuttle Main Engines) with them to their display locations. 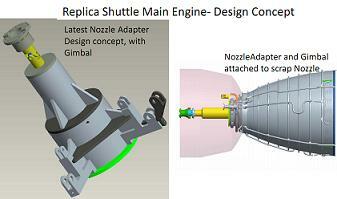 Instead, Replica Shuttle Main Engines (RSMEs) will be fitted to all three orbiters. Therefore, Discovery’s SSMEs from STS-133 will be removed following her return to OPF-3. Under previous timelines which would have seen Discovery launch during the early November 2010 launch window for STS-133, OV-103’s SSMEs would have been removed the second week of January. This schedule, however, is in flux given the now NET 30 November 2010 launch date for Discovery. Then, under the now preferred option for Discovery’s display configuration (which is still under review), Discovery would be fitted with three RSMEs No Later Than (NLT) April 15, 2011 – a date which would also be in flux given the fact that Discovery is still on Pad-A. 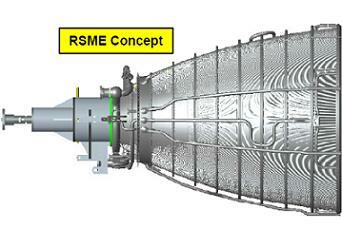 Once the RSMEs are installed, nominal SSME close-out operations (including installation of the Engine Mounted Heat Shields and Dome Heat Shields) will be carried out on the RSMEs. 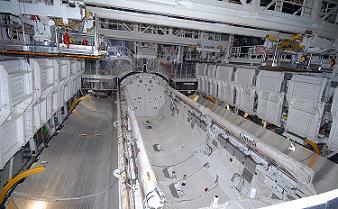 Discovery’s RSMEs would be installed in April 2011 with final closure of OV-103’s payload bay doors occurring in June 2011. 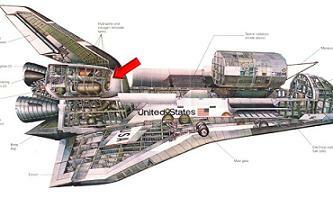 Closure of the payload bay doors would be followed that same month by the final power down of Discovery. Pyrotechnic safing would be completed by the beginning of August 2011. Discovery would then be jacked down, weighed, and her final Center of Gravity determined in October 2011. Then, in early November 2011, Discovery would be ready for transfer to her final display site. In addition to specific payload and Main Engine requirements, Discovery’s twin OMS pods and FRCS pod will need to undergo deservicing operations at the White Sands Test Facility (WSTF) in New Mexico. To accomplish this, the pods will have to be transported over land to White Sands. As such, the pods will have to be configured for transport – a configuration that will have to meet DOT (Department of Transportation) safety regulations. Moreover, Ground Support Equipment (GSE) for the handling and transportation of the pods will have to be manufactured/modified and pre- and post-transfer inspections of the pods will have to be performed both for their journey to WSTF and their journey back to KSC. To begin the task of supporting the pods’ transfer, a Technical Interchange Meeting (TIM) occurred on October 12-13 that determined preliminary work to be performed at KSC for the pods transfer as well as the overall configuration of the pods for shipment. 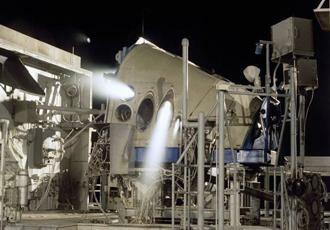 Once this is complete, the pods will be placed into their shipment configuration, including: a 40psia system blanket pressure propellant, a 40psia helium/GN2 (gaseous nitrogen), the closure of all valves, all feedlines purged, the OMEOME tile covered and heatshield removed, the primary OMS nozzles removed, all doors installed without carrier panels, and less than 25 lbs N204 and less than 20 lbs MMH.